This entry is filed under Uncategorized and tagged chocolate. I’m a born-again 49ers fan. OK, so maybe I never was much of a football fan growing up, but even a goth like me knew we had the best football team in the country back in the 80’s. One of my classmates was trying to convince us that the 49ers are going to the playoffs this year. In his presentation he had an action shot of the most gorgeous arms I’ve ever seen. 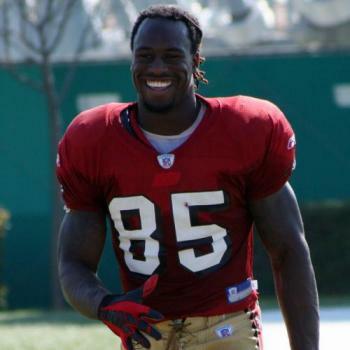 So I dug up some more pix of Vernon Davis and damn… SI needs to do a Swimsuit Issue for the ladies and put Vern here on the cover. and the centerfold. Finished my paper on Democracy. Basically just talked about some articles I’d recently read, showing how we’ve kinda run full circle back to a form of tyranny not unlike the tyranny we escaped from 230 years ago. I was very happy to see that both Time and Harper’s magazines had articles asking the American public what I’ve been wondering for a few years now. Why don’t we just impeach the brat? And his trigger-happy sidekick, while we’re at it? Jeesh. How much more are people willing to put up with? In other news, the sun is out so I get to ride to Santa Monica instead of taking the cage. Like most SoCal riders, I’m deathly allergic to rain, and convinced that my bike will melt if I take it out in the rain. I used to know how to ride in the rain, hell, I even used to race in the rain, but not anymore. Survived a rare trip to Costco yesterday. While they didn’t have what I actually wanted, I did pick up a lifetime supply of cotton makeup pads and kiwis. Made Heather drive, even the shopping cart. We almost gave in to the temptation to look at people’s pix. It’s so tempting, they’re all there, and no one would know. When we were ready to, there were a bunch of people looking at pix, probably not their own, either. In any case, judging by how little I enjoy looking at Costco customers, I doubt I’d enjoy looking at their pictures.